FT-22: Hidden hardware adds to the clean, custom appearance. 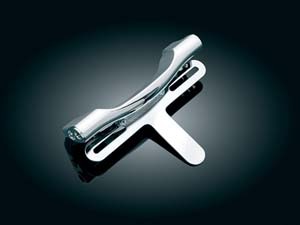 Mirror-chrome surface and embossed Harley-Davidson® lettering. Hidden hardware adds to the clean, custom appearance. Inverted-wing tip and support rails complement the sweeping lines of the fender. Stylish replacement for the traditional rubber bumper and rails. Completed installation mirrors the design of the Original Equipment fender tip and spears. Fits '14-later FLHTCU, FLHTCUL, FLHTK and FLHTKL models. Special order item. 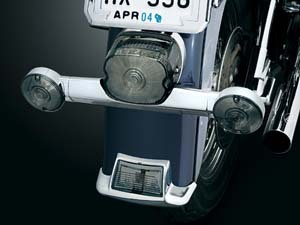 EG-FT-LED: Front Fender Tips for '14 and Newer HD Touring. 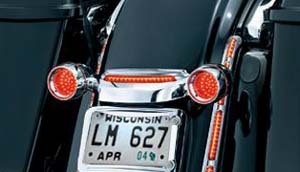 Fits: Ultra Classic, Electra Glide, and Road King Families. 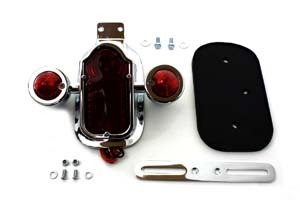 Direct replacement for front fender OEM Light or decorative piece (Road King). Choice or Amber or White LEDs. 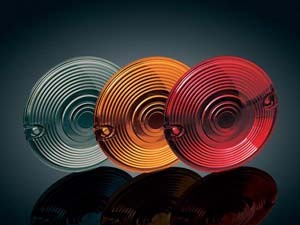 Choice of Clear, Smoke, or Amber Lens. Choice of Chrome or Gloss Black Finish. EG-FT-A: 40 wide angle super bright next generation Genesis® LEDs. 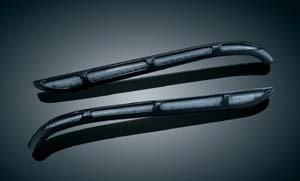 Fender tip fit the front fenders on all '13 and Earlier Touring (FLH) and Heritage Softails®; Fits '14 Heritage Softail, 15 Heritage Softail Classic. Lifetime OEM warranty. EG-FT-W: 40 wide angle super bright next generation Genesis® LEDs, Light only. 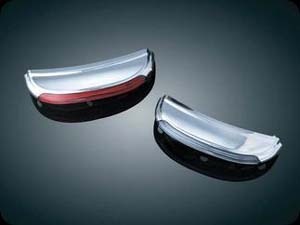 Fits fender tips fits for front fenders on all '13 and Earlier Touring (FLH) and Heritage Softails®; fits '14 Heritage, Softail, '15-'16 Heritage Softail Classic. Lifetime OEM warranty. EG-FT-TOUR: Rear Wrap Around Dual Intensity LED Fender Tip. 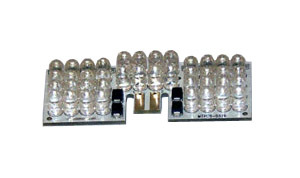 Complete plug and play unit including lens, housing, LEDs, harness, connector, 40 Red Dual Intensity Genesis LEDs. Running and Brake Modes. Adds Additional LED Brake Light. Lifetime OEM Warranty. Plug and Play. 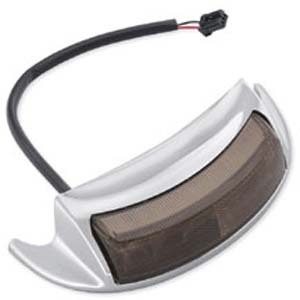 Available With Smoke or Red Lens/ Fits: '09-'13 FLHTC, FLHTCU, FLHTK; '14 FLHTCU, FLHTK, 15 FLHTCU, FLHTCUL, FLHTK, FLHTKL. 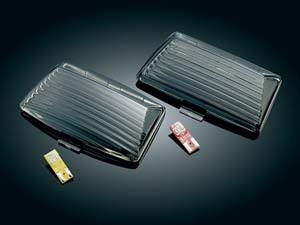 TS-44: Black turn signal combo assembly set features a unique LED array. 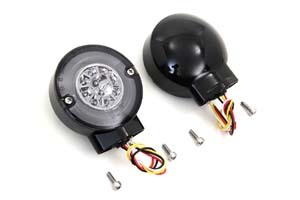 The center LED is for the turn signal and the outer LED can be wired to work with running, marker, tail or stop lights. Sold as a pair. Fits:FLT 1986-UP, FLST 1986-UP. 5413: Same as above but with smoke lenses. 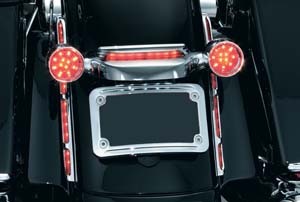 3154: Lighted Turn Signal Bar Filler Panel, Red Lens (ea) Fits: '10 Street Glides & '10 Road Glide Customs. Provides both low "run" & high "brake/turn" intensity. 3153: Same as above but with smoke lenses. 7758: Add additional Run-Brake L.E.D. lighting to your rear end! 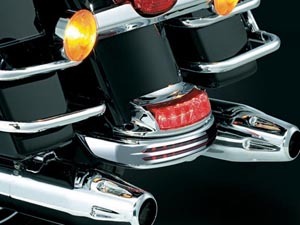 The gently curved chrome housings sit perfectly in the contour of the rear fender skirt, but also look great on most any full-length fender.Fits: '97-'13 H-D Touring & '96-'13 FL Softail Models with Full Length Rear Fenders. 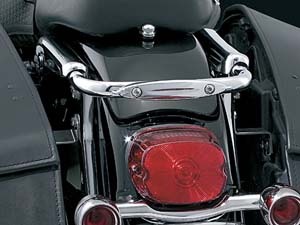 Universal Applications: Lights are 12" Long and Can Be Installed on Most Motorcycles with Flat-sided Full-length Fenders. 7744: Similar to above but in gloss black. 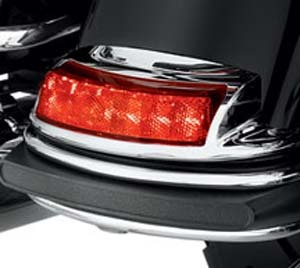 HD-685: Upgrade your Touring model's Original Equipment fender tip light from a single-mode running light to a dual-mode running and break light. 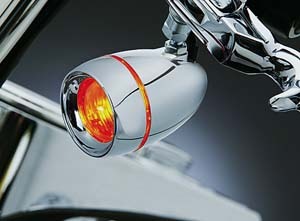 The brilliant lamp glows red in the running mode, and increases in intensity when the brakes are applied. 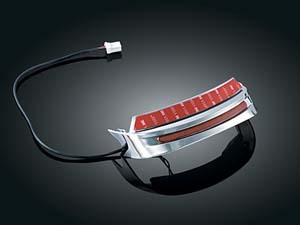 The available red lens complement any styling direction. Easy-plug-in connection to the Original Equipment wiring harness. Fits '09-later FLHTC, FLHTCU and FLHTK models. HD-776: Same as above but in smoke color. 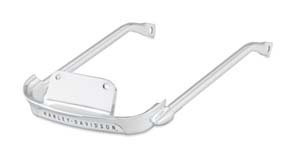 2107, 2108, 2109: Complete the package when using H-D's accessory headlamp trim rings! An extended chrome bezel encompasses a recessed lens to provide a sleeker and racier appearance than the stock lens alone. Bezels and lenses snap into place just like the original factory lenses and retain the stock bulbs and housings. Colored bulbs smoke lenses must be purchased separately. Fits: '04-'10 FLTR, FLHRS, FLHX, FLHTCSE, FLHTCUSE, FLHRSE. 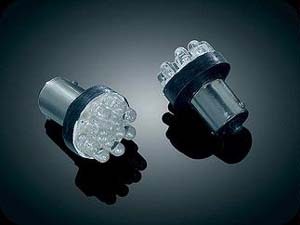 2098: Here is a really trick set up that will allow you to replace your large, stock rear turn signals with these streamlined, bullet shaped turn signals and relocate your license plate below the taillight. There is a built-in light to illuminate the relocated license plate. 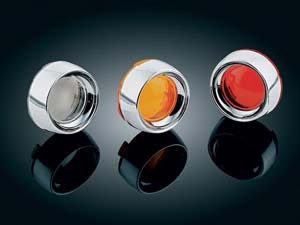 The bullet shaped turn signals are single circuit and come equipped with our stylish deep-dish bezels with red lenses. 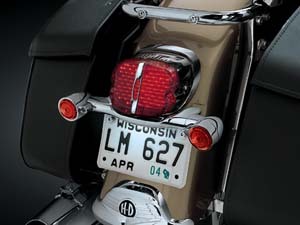 A flat license plate support is included, but a trick curved frame/backplate is available as an option for 4”x 7” plates. 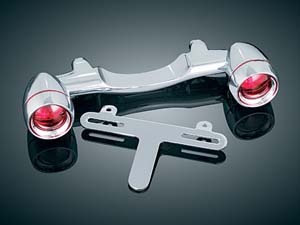 Fits: '91-'13 Electra Glides, '91 - '96 Tour Glides,'98-'10 Road Glides, '94-'14 Road Kings, '98 - '08 Road Glides, '06-'10 Street Glide & '86-'14 FLST/C/N. 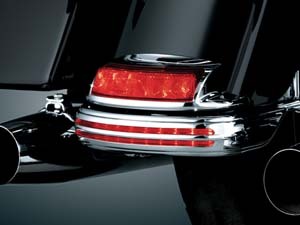 5405: Replace your large, stock rear turn signals with these streamlined, bullet shaped turn signals & relocate your license plate below the taillight. Built-in light illuminates the relocated license plate. 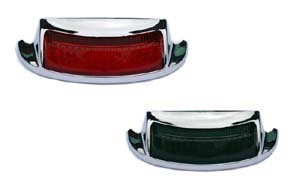 Single circuit turn signals come equipped with our stylish deep-dish bezels with red lenses. 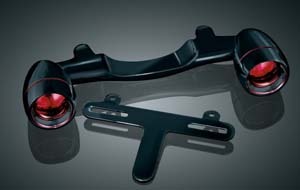 Fits: '91-'13 Electra Glides, Tour Glides, '94-'14 Road Kings; '98-'08 Road Glides, '06-'09 Street Glides & '86-'14 FLST/C/N. 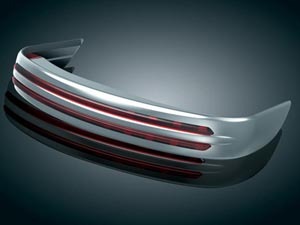 2099: Streamlined rear turn signal bar is dramatically different than other custom turn signal bars. Not only is it sleeker and narrower than the stock piece, it also gives you the option of relocating your license plate below the taillight. 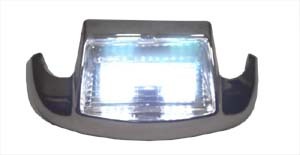 The 2099 has a built-in license plate light and a flat license plate support is included. A trick curved frame/backplate is available as an option for 4" x 7" plates. Fits: ’91-’10 Dressers and Road Kings. 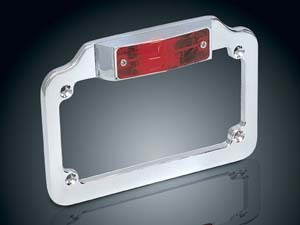 3162: Curved License Plate Frame. Fits: 4" x 7" plates. 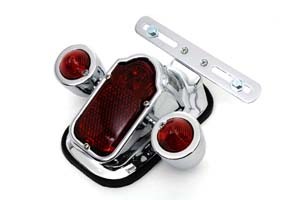 3163: The Street Glide is very cool, but this bolt on, gracefully curved license plate mount makes a big difference. Rid yourself of the stock black bracket and the flat look. No drilling - no need for new license plate light. Just bolt it on and go! 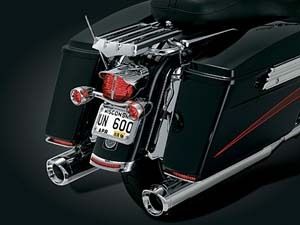 Fits: '06-’09 Street Glides, '09 Road Glides, ‘09 Electra Glide Standards, ‘09-’10 Road Kings, ‘07-’08 FLHRSE, & ‘05 FLHTCSE. 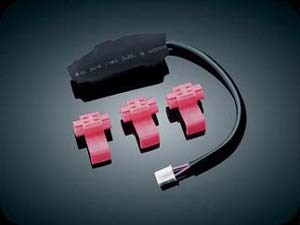 3157: Same as above for: Fits: ‘10 Street Glides & Road Glide Customs. 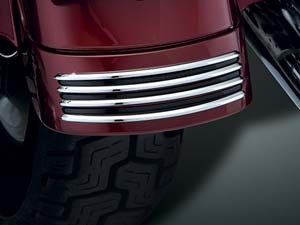 8644: This subtle lighted chrome Fender Skirt is just enough to catch your eye without dominating the scene. Accented with a sliver of red L.E.D. light, it also serves as an auxiliary running and stop light. High strength peel-and-stick adhesive makes installation a breeze. 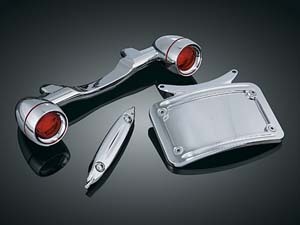 Fits: '98-'08 Road Glides, '04-'07 Road King Customs, '02-'03 FLHRSE, '04-'05 FLHTCSE, '06-'08 FLHTCUSE. 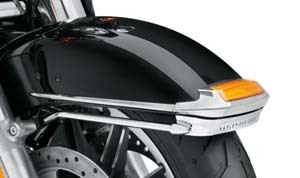 7797: Rear fender accents: Fits: '06 and up FLHX Street Glide, '10 and up FLTRX Road Glide Custom. 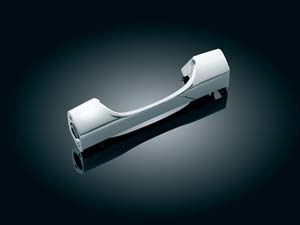 2384: Tuck in your obtrusive turn signals with this streamlined Rear Turn Signal Bar. 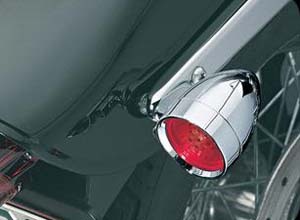 At 8-1/4", it is about 4-3/4" shorter than the stock bar, this die-cast, chrome-plated replacement bar bolts on easily and accepts the stock turn signal assemblies. 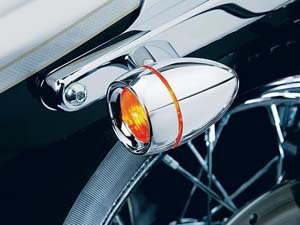 1619: Silver Bulllet, LED red turn signals lights. 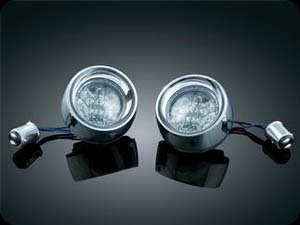 4824: Front Smoke Fender Tip Lens & Bulb kit for Dressers. Ditch your stock lenses and show some style with the Smoke Fender Tip Lens Kit. Includes fender tip lens with Amber L.E.D. bulb. Fits: '86-'10 Electra Glides, Tour Glides, Road Kings & FLST Models with 3-1/4' Flat Turn Signal Housings & Fender Tip Lights. 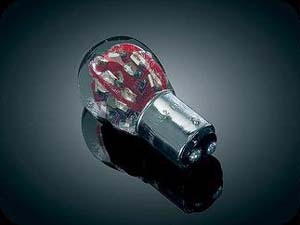 4823: Same as above with Red LED bulb for the rear. 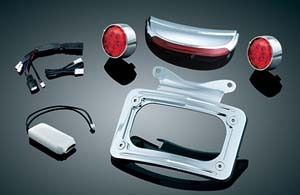 Fits: '86-'09 Electra Glides, Tour Glides, Road Kings & FLST Models with 3-1/4' Flat Turn Signal Housings & Fender Tip Lights. Note: Does not fit '09-'10 FLHTC/U. 4994/4995: Ditch your stock lenses and show some style with our Smoke Lens Kits. Kits include fender tip lens with L.E.D. 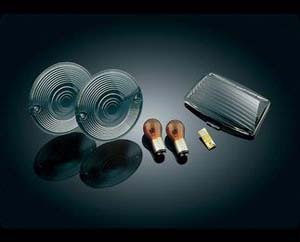 bulb and a pair of smoke turn signal lenses with red or amber incandescent bulbs for front or rear respectively. 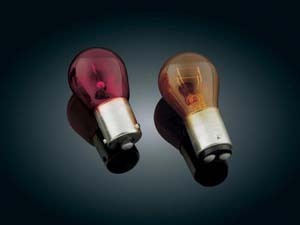 4812, 4813 & 4814: Direct replacements for 1156, 1157 or 3157 bulbs, these red and amber bulbs are just the ticket for bikes with clear or smoke turn signal lenses. 4812: Red - Replaces 3157 (ea), 4813: Amber - Replaces 1157 (ea), 4814: Red - Replaces 1156 (ea). 4725, 4996 & 4997: Replacement Lenses. Amber, Red and Smoke (pr). 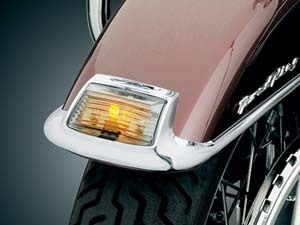 Fits: '86 to current 3-1/4" Flat Style Turn Signals (Electra Glides, Tour Glides, Road Glides, Road King, & Heritage). 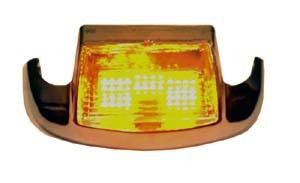 4810: Universal Load Equalizer for use when stock turn signals are replaced with L.E.D. or other low-draw lights. One required for each pair of lights.